Have you wondered if banks would only suggest their own mutual fund companies? If you go to an Axis Bank branch, would they only suggest an Axis Mutual fund scheme for you? 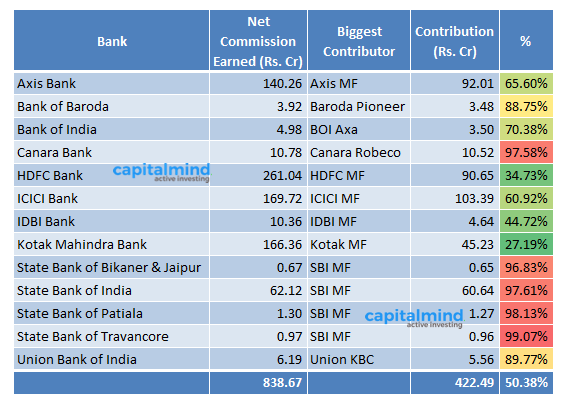 We now have this data – how much did banks earn as commission from their mutual fund companies? Typically most mutual funds are subsidiaries of the banks themselves. (HDFC is special: HDFC Mutual Fund is owned by HDFC, which is the parent of HDFC Bank and a different entity). 50.38% of the commissions earned by 13 banks were paid by their sister firms with Canara Bank earning over Rs. 10 crore or 97.5% of its commission earning from Canara Robeco Mutual Fund. At the other extreme, Kotak Mahindra Bank was paid only Rs. 45.23 crore by its subsidiary Kotak Mutual Fund which constituted just 27% of the overall commission earnings for the Bank. As you can see, banks tend to push only the mutual funds with their own names – they get most of their commissions from their own fund houses. Banks, as entities that people trust, should not try to sell their own funds while pushing products, because a better performer or a lower cost product may be from a different fund house. But this seems to be an incestuous world – as most banks seem to push their own mutual funds only! Kotak seems to be the only really diversified distributor, which earns only 27% from its own fund house. Hope you have found this article useful. If you would like to see any other features added to this, do leave your feedback in the comments section below.